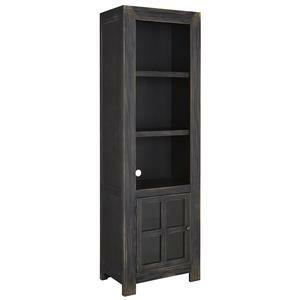 This bookcase pier is perfect as a standalone piece in your living room, office, or dining room space; or in combination with the other bookcases in this collection. Offering both concealed storage and display shelves, this piece will add visual appeal and convenience to your home. The Midtown Bunching Bookcase w/ Doors by Parker House at Beck's Furniture in the Sacramento, Rancho Cordova, Roseville, California area. Product availability may vary. Contact us for the most current availability on this product. Give your home office and entertainment space the upgrade they deserve with this collection. These gorgeous pieces are finished in a smoked grey, offering up a rustic charm for your home. The Midtown collection is a great option if you are looking for Casual furniture in the Sacramento, Rancho Cordova, Roseville, California area. Browse other items in the Midtown collection from Beck's Furniture in the Sacramento, Rancho Cordova, Roseville, California area.